Beautiful Victorian Antique gold and seed pearl Brooch featuring a round centre pearl. It dates from the mid to late 19th century. It may have been worn as a Wedding Brooch. It comes in the good quality antique jewel box you can see in the photos. Please note; exterior age related scuffs to the box. Delicate openwork design featuring scrolls and flowers, it is set with all original seed pearls. The pearls have good white nacre/ lustre. The Brooch is exceptionally well modeled and finely detailed with a lace like appearance. Made from yellow and rose gold - marked 9ct to the reverse, along with maker's marks H & OA. The Brooch measures 1.25 ins. Total weight is 3.80 gms. Good hook and (metal) pin. Some very light wear consistent with age. To the reverse there is the remains of a safety chain fitting. 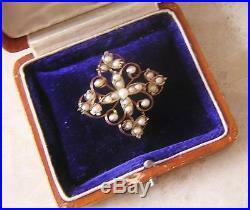 BEAUTIFUL VICTORIAN GOLD & SEED PEARL BROOCH PIN in JEWEL BOX - ANTIQUE WEDDING. Beautiful antique Victorian gold and seed pearl Brooch featuring a perfect round centre pearl. It comes in the antique jewel box you can see in the photos. Please note; Antique box has age related scuffs to the exterior. If you would prefer a good quality new jewellery box please state. It may have been an antique wedding Brooch as it has a lace like appearance. Iconic Victorian openwork delicate design featuring scrolls and flowers, it is set with all original seed pearls displaying good white nacre/ lustre. This is a well constructed Brooch with exceptionally fine detailling. Made from yellow and rose gold- marked 9ct to the reverse, along with maker's marks H & OA. Total weight : 3.80 gms. Some light age related wear. To the reverse is the remains of a safety chain loop fitting. Good hook and (metal) pin with a curly C catch. This is a superb example of it's type. It would make the finest addition to any collection, and be beautiful to wear. Personal Cheques from the U. To be fair to everyone, - We don't do that. We always take very great care in wrapping your items. We always obtain a certificate of posting or receipt from the post office. We will always forward you any tracking numbers. We cannot be held responsible for items once they have left me. We do not make a claim on your behalf. Small Parcels 1st Class max. PLEASE NOTE: ANY UNDER INSURED PACKAGES WILL BE AT YOUR RISK. This includes Europe/ USA /Canada / Asia / Australia & New Zealand. SMALL PACKET SIGNED FOR INTERNATIONAL. PLEASE NOTE: ANY UNDER INSURED PACKAGES WILL ENTIRELY BE AT YOUR RISK. PLEASE NOTE : ANY UNDER INSURED, PACKAGES WILL BE AT YOUR RISK. Auctiva Offers Free Image Hosting and Editing. The item "BEAUTIFUL VICTORIAN GOLD & SEED PEARL BROOCH PIN in JEWEL BOX ANTIQUE WEDDING" is in sale since Saturday, August 12, 2017. This item is in the category "Jewellery & Watches\Vintage & Antique Jewellery\Vintage Fine Jewellery\Victorian (1837-1901)". The seller is "ladygateley1" and is located in Norwich. This item can be shipped worldwide.